If you love simple Italian food like I do, then you’ll love this recipe. The rich taste of chicken and mushrooms in this traditional Italian dish gets its distinct flavor from the Marsala wine. Marsala is common in Italian cooking and well worth the buy if you love to cook with wine. Braising meats and vegetables with it brings out a wonderful, earthy flavor everyone will enjoy. 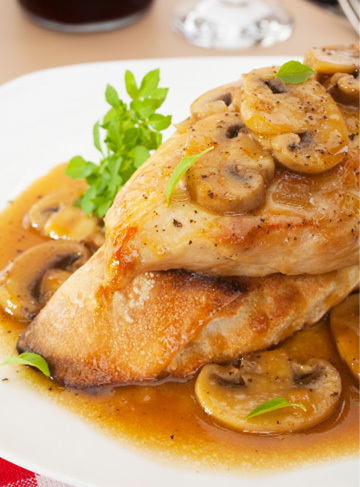 Chicken Marsala is ideal for a quick weeknight dinner or a last-minute meal served to guests. Chicken Marsala is the perfect weekday dinner, but looks and tastes elegant enough to prepare for company. It’s a delicious Italian dish your family will ask for over and over again. Serve on a bed of steamed rice or pasta for a complete meal. In a flat baking dish, stir together flour, salt, black pepper and oregano. Gently press the flattened chicken cutlets into the mixture to coat and shake off excess flour. Heat olive oil in a large skillet over medium-high heat. Place the chicken cutlets in the skillet and cook five to seven minutes per side, until golden brown. Drain chicken on a paper towel-lined plate. If needed, add more olive oil to the same skillet. Stir in garlic and cook for a minute. Add the mushrooms and cook until tender, about 10 minutes. Stir in Marsala wine and sherry. Season with salt and pepper. Transfer chicken back to the skillet and spoon sauce over each piece. Raise heat to medium-high and bring to a boil. Cover, and then reduce heat to medium-low and simmer for about five to seven minutes, until sauce becomes thick. Stir in butter. Serve the chicken and sauce over steamed rice.